Basseterre, St. Kitts – Minister of International Trade and Commerce the Honourable Lindsay Grant eembarked on a mission this year to revisit the Guyana- Brazil, St. Kitts-Nevis Partial Scope Agreement, which, when finalized, will give manufacturing companies in St. Kitts and Nevis a near zero percent tariff entry into the English and Portuguese-speaking South American countries’ markets. 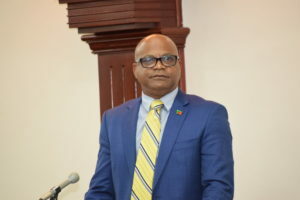 Minister Grant said that the agreement is in its final stages and his ministry has sent representatives from St. Kitts and Nevis to engage in discussions. “We have had the opportunity of having an official from the Ministry of International Trade and the president of the Chamber of Industry and Commerce, Jose Rosa, travel to Guyana to meet face-to-face to meet with their Guyanese and Brazilian counterparts in an effort to explore the modalities for a new trading arrangement and to finally conclude this most important agreement,” he said. The minister said that the Brazilians have also submitted a counterproposal to have goods enter into the federation’s market. “Obviously they want goods into our market also and so it is a give and take,” he said. Minister Grant said that the manufacturing sector is not the only aspect of trade that is being looked into within the agreement, but also there are other sectors that may interest the Brazilian and the Guyanese market. “So, we look toward agriculture, which has a very important component also in terms of the market in Guyana and Brazil,” he said. Minister Grant assured that the government will continue to work on finalizing the agreement. “We expect that when 2018 rolls in, we hope to conclude this most important agreement; I would hope in the first quarter of 2018,” said the minister.